If today were not a Sunday, it would be celebrated as the feast day of St. Rupert of Salzburg. Rupert, a holy man of the 8th century, was the bishop of Worms in what is present day Germany. Because of his reputation, the duke of Bavaria asked Rupert to come and help revive Christianity in that region. Rupert asked to be given an area called Juvavum, which was the early name of the city of Salzburg, Austria in order to establish a See and a monastery. One of the first things St. Rupert did in Salzburg was to build a church in honor of St. Peter and its adjoining Benedictine monastery. That church stands to this very day. 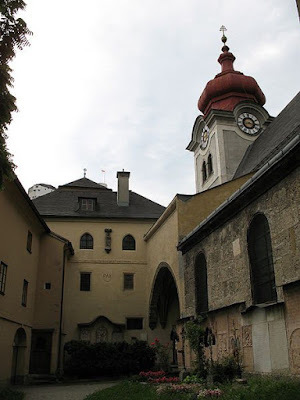 Another thing Rupert did was to establish the Nonnberg Abbey in the hills above Salzburg. It is the oldest continuously used abbey north of the Alps. Nonnberg is also the abbey where Maria Kutschera went as a postulant and from which she was sent out to work as a nanny for a certain Captain Von Trapp and his brood. In addition to setting the stage for the Sound of Music, Rupert developed the salt industry which was the lifeblood of Salzburg for centuries (Salz in German means salt, ergo Salzburg is "salt city".) I lived in Salzburg for a short while and did a tour of those salt mines. It was a time when I was much more daring since touring the salt mines involved sitting on what appeared to be a giant skate board and descending into dark mines that had been abandoned for many, many years. Because salt was such a precious commodity in the days of St. Rupert and onward, Salzburg became a major commercial town and episcopal see. Many churches and monasteries are still standing and are surrounded by some of the most magnificent scenery in Europe. St. Rupert died in the monastery in the year 718.